FLINT -- How does your child's school stack up? A Michigan magazine is reporting which schools made the grade by rating them based on test scores and income levels. When Rachel Portis and her three kids moved from Genesee Township to Flint, sending her children to the International Academy of Flint was a no-brainer. "This school, couple people I worked with had good ratings about this school so I decided to try it," said Portis. Her experience, so far, has been a positive one. "I am so happy," she said. And so are educators. "Our director yesterday sent out a great memo to everybody way to go staff! Congratulations," said Art Wezlaff, Director of School and Community Relations at International Academy of Flint. 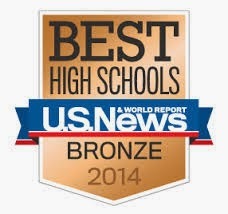 The school was named an "Academic State Champ" in Michigan's Bridge Magazine. The International Academy was ranked in the top 10% of 540 Michigan schools. "Looked at raw test scores and compare them with percentage of free and reduced lunch at each school and then compare those schools to similar schools that have the same percentage of free and reduced lunch," explained Ron French, senior writer at Bridge Magazine. French says the ranking recognizes "at risk" schools by taking raw scores into account, however, many schools are exceeding expectations. Something parents can attest to. "My son, he has some challenges and this school has really helped him out a lot, a lot," said Portis. Bridge magazine ranked 540 Michigan school districts and charter schools. Several other Mid-Michigan schools made the grade including Davison Schools (35). Others, including Flint and Beecher Public Schools fell to the bottom of the list.